No country has the diversity of grapes (nearly 2,000 varieties), and, the number of different wineries as does Italy...a country with some of the finest wines in the world. We got to sample a few of those wines on March 28th at Madonia Restaurant on Long Ridge Road in Stamford. Following our Prosecco reception attendees sampled Greco di Tufo, Est Est Est, Barbera D'Alba, Primativo and Cesanese (close to thirty wine enthusiasts were in attendance). We met in Madonia's private party room where we started off with an extra dry Rivata Prosecco as well as a sparkling rose from La Vostra. There were also pastas, pizzas, a house salad and a commentary on Italian wines by Dean Gamanos, founder of the Wine Society. Dean explained how Italy is one of the world's largest wine producers and how quality has improved considerably since a classification system was introduced in 1963 (and upgraded in the 1990's when European Community standards were instituted). All the wines were well-received. The last pour was the Cesanese, a red from Rome which has caught the attention of the young set which enjoys it while dining about town at Roman trattorias. 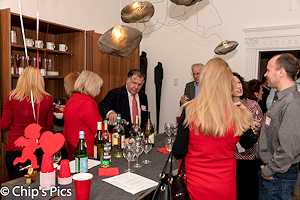 "Wine Tasting for Wine Lovers"
Over 50 wine enthusiasts gathered at the Bulthaup kitchen design studio in Greenwich on Feb 13th for a glorious evening of fine wine, tasty hors d’oeuvres, door prizes, good company and fun (lots of chocolates too)! Amidst colorful balloons, cupids, and confetti, Wine Society members got to hobnob with one another while sampling a number of red and white wines, both varietal favorites like French and American Chardonnay, Pinot Noir and of course Cab Sauvignon, as well as some not-so well-known wines like Alborino, Gavi, and a Chilean Syrah. As part of his welcoming remarks, Wine Society Director Dean Gamanos declared wine as the beverage of "romance" and described how wine has been linked to love over the years in both poetry and cinema. 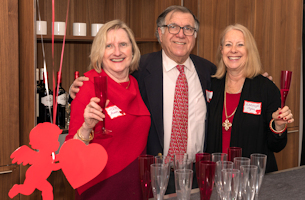 To cap off this “evening to remember” a record number of door prizes were given out, including Greenwich Symphony tickets, a bottle of Clinton Vineyards “Romance” dessert wine, chocolate assortments, and a Mark Roberts ”Valentines” fairy. When Fall arrives and the weather starts getting colder, many of us prefer wines that are fuller bodied… even more so in winter. And our tastes preferences often shift to reds over whites. Holiday dining and its sumptuous feasts means thoughts on pairing wines with various dishes and bolder wines are frequently selected to match the heartier meals of winter (as compared to the lighter fare of summer). 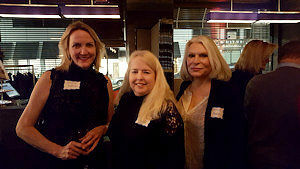 On November 29, close to 40 Wine Society devotees joined us for a sit-down tasting of Fall and Winter wines. Following our reception, we sampled a French Chardonnay from Macon (some enjoy Chard with Thanksgiving turkey, although Pinot Noir is my preference) and a German Kabinett Riesling. For reds there was Porta Carmenere from Chile, Fleur du Cap Pinotage from South Africa ( a clone of Pinot Noir and Cinsault) and a divine Beaurenard from France’s Rhone valley (southern). And the chefs at Madonia did not disappoint with their hearty hors d’oeuvres (so much so, that several of us stuck around for dinner after the tasting for more culinary delights). Happy Holidays everybody! The Wine Society held a Sangria picnic in Byram Park . Over 80 wine enthusiasts joined us at the park's hilltop gazebo which offers gorgeous views of the harbor below. There was good networking going on not to mention delicious roast pig...the weatherman was cooperative as well. A splendid afternoon for all and no doubt to be repeated next summer. Forty wine enthusiasts gathered at Greenwich’s Gingerman to enjoy several light refreshing summer wines that are perfect for summer’s lighter foods and warmer climes. This event is a Wine Society favorite as is the upstairs party room at the Gingerman especially when they can open the large windows overlooking Greenwich Ave. on a sunny, breezy, but not-too-hot, late Spring evening. 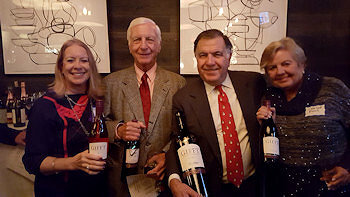 The Society had a great turnout at Putnam and Vine on East Elm Street in Greenwich where Julia Lewis led a tasting of old vs. new world wines. We tasted an old world Sancerre from the Loire Valley in France vs a new world Sauvignon Blanc, a French Burgundy vs a Pinot Noir from Oregon and a Bordeaux from France vs a Cab Sauvignon from Washington State....truly, a remarkable evening! We celebrated the Wine Society’s anniversary (#10 – time flies when you’re having fun) at Isabella’s stunning art emporium on West Putnam Avenue in Greenwich. The Gallery had an amazing photo exhibit which our members seemed to enjoy as much as the delicious Prosecco and catered hors d’oeuvres. Thank you again Isabella! 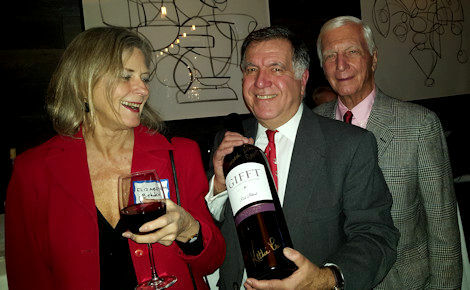 Over 30 wine enthusiasts joined us at the acclaimed Sonora restaurant in Port Chester. for an evening of wine sampling, tapas tasting, networking and fun. We started with a& Cava (sparkling wine) reception and then sat down in Sonora's private dining room to sample several Spanish varietals including Albarino, Verdejo Grenacha, Temranillo, and a crowd pleasing Monastrel (Tesoro deBulbas - 90 points ). We also talked about the various wine regions of Spain, one of the largest "Old-World" wine-producing nations. There were also "Nuevo Latino" hors d'oeuvres as only the chefs at Sonora could prepare them (goat cheese empanadas, Mahi Mahi tacos, shrimp cooked in white wine sauce & garlic, and more). This year our annual Prosecco Party (in celebration of the Society's 9th anniversary) took place at Shreve, Crump and Low jewelers in Greenwich. Several varieties of Il Monello Prosecco were offered, including some with a touch of peach nectar added to make Bellini cocktails. Attendees also enjoyed many delicious hors d'oeuvres and cheeses thanks to the skilled oversight of France's former "Cheese Ambassador" Cecilles Delannes. Thank you Cecille and many thanks to Brad Walker for hosting us at his family's stunning store. Shreve, Crump & Low, whose headquarters are in Boston, is one of the nation's oldest jewelers. Our Prosecco parties are always fun and a great opportunity to see old friends and make new ones. As in prior years there was lot's of merriment and a minimum of wine talk . It's not a surprise then that turnout for our annual Prosecco Party is always strong. Our last event at Polpo, Greenwich’s popular, and perhaps most romantic Italian eatery, was a huge success! For our networking reception we enjoyed a delightful Il Mionetto Rose Prosecco and a very fresh & fuity Pinot Grigio. Then we went on to the whites...a Gavi San Mateo and a Greco Di Tufo Donnaschiara, both exceptional! The reds were also sensational, a Barbera d'Asti by Pico Maccario, and a Nebbiolo from Langhe, Ochetti, by Renato Ratti. For the finale, we had an absolutely amazing Chianti Classico Reserva from Tenuta di Renieri.. There were also tasty hors d’oeuvres, as only the chefs at Polpo can prepare them, and, of course, great company! After the tasting a number of us headed downstairs to their lively piano bar. What a night! For the third year in a row the Wine Society has held a holiday reception at Blackstone's offering good wines, great company and very tasty, hearty hors d'oeuvres. At our December 6th reception over 50 attendees enjoyed each other's company, 17 different wines from Europe and the U.S. (perhaps the largest selection for a Greenwich Wine Society party), and very tasty hors d'oeuvres including Blackstones' famous sliders, chicken tenders, bacon chunks and more! Our members loved Kathie Lee Gifford's wines from Monterey California including her Chardonnay, Red Blend and Rose (thanks Kathie for the signature bottle -- see photos). All the wines were well-received and in particular the Chateau Du Bois Chantant from Bordeaux was quickly consumed as was the Bolio Chianti Classico, the Ryder Estates Cabernet Sauvignon and Dr. Heidemann's Dry Reiesling from the Mosel region in Germany. We had a large turnout on October 12th, at Greenwich's new "Perfect Provenance" boutique located on Arch Street in Greenwich. Over 50 wine lovers sipped and networked while perusing art work and a variety of unique gift and clothing items --tasty hors d'oeuvres too. Thank you to proprietor Lisa Lori for hosting the Wine Society. Over 10 wines were sampled, including several from France (Vouvray, Muscadet, a southern Cotes du Rhone and a Rosé from Nime). There was Prosecco, Pinot Grigio and an interesting Salice Salentio Riserva made with 100% Negromavro from Italy, plus several domestic varietals from the U.S. It was a warm, Fall evening so the festivities extended to the outdoor deck. A memorable reception, indeed! OUR SEPT 16th , 2016 ..."WINE LOVERS' CRUISE"
We once again sailed aboard the charming "Prudence", a historic, wooden-hulled coastal steamer that in yester-years ferried New Englanders to islands off the coast of Maine (and later hosted Kennedy family parties off Cape Cod) -- our cruise has now become a popular annual event. We departed from Greenwich Harbor at 7 in the evening and cruised the picturesque waters of Long Island Sound in and around Greenwich. Hors d'oeuvres were catered by Andy Burke and included freshly shucked oysters, It's no wonder that close to 60 wine aficionados signed up for this extra special event at sea,..truly, "an evening to remember!" On July 27th we sampled close to a dozen different summer wines, with a focus on Rosés and whites...wines well-suited to the season's hot, sultry weather. Best of all our event was a lawn party at John Dolan's gorgeous home on Maple Avenue in Greenwich, where in addition to the wines we also savored a variety of delicious hors d'oeuvres, both hot and cold, prepared by Burke Catering. The weatherman was cooperative as well providing us a beautiful, sunny and not-to-hot, summer evening. With over 50 attendees it was a delightful, alfresco affair! A large and fabulous group of wine lovers joined us on June 9th for a delightful evening in celebration of the Greenwich Wine Society's Eighth Anniversary. We enjoyed six three different kinds of Prosecco while mixing and mingling with fellow wine enthusiasts ...tasty hors d'oeuvres too! 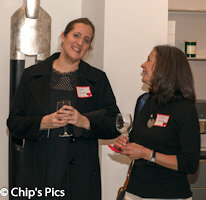 The event was held at the stunning Mitchell Gold + Bob Williams furniture gallery on the Post Road in central Greenwich. We've celebrated our anniversary with a Prosecco party every year since the Wine Society was founded in 2008 (and hope to continue doing so for many years to come). "Pinot Noirs from Around the World"
We started out with a sparkling wine reception accompanied by tasty hors d'oeuvres. This was followed by a tasting of five Pinot Noirs from France, New Zealand, Chile, Italy and the United States. Colin Goundrey, proprietor of Bar'Lees and oenophile extraordinaire, was on-hand to provide commentary. Door prizes too, as is customary at many of our events. "Searching for the Soul of Burgundy.."
Tuesday, March 1st, 2016 - Sold Out Event! We were fortunate to have wine author and wine expert "JP" Bary join us once again at The Gingerman in central Greenwich to lead us in a tasting of his "finds" from Burgundy. The wines of Burgundy located in the heart of France have been appreciated for centuries and many command some of the highest price points. We began as we often do, with a reception featuring a French sparkler (Cremant de Bourgogne) at the restaurant's lovely upstairs private dining room where attendees were able to network and enjoy a variety of hors d' oeuvres. The wines subsequently tasted included an Alligote, a Cremant, Chardonnay, Beaujolais, Pinot Noirs, all available at an affordable price. Mr. Bary, has traveled extensively throughout eastern and western Europe, and beyond, seeking out lesser-known yet extraordinary wines. He has many wine contacts including growers, winemakers, importers, distributors and retailers and his palate is among the best. His book, The Persistent Observer was available for sale at the event and on line at Amazon. Based on the enthusiastic response of our members we hope to have Mr. Bary back again in the not-too-distant future. 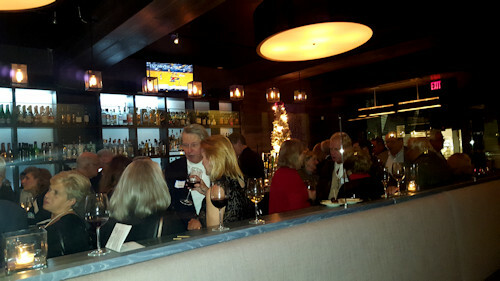 Over 50 wine enthusiasts joined us at Blackstone's Steakhouse on December 9th for our "Holiday Reception." People enjoyed the Casas Patronales Carmenere and other fine wines. The delicious sliders and other hearty hors d'oeuvres were a big hit as well ....good networking too! "An Evening of Exquisite Jewelry and Fine Italian Wine"
On Friday, October 23rd we sampled a number of fine Italian wines, tasty hors d'oeuvres, along with commentary by Douglas MacLeod, Regional Manager of Mionetto USA. Our reception began at six pm when we sampled refreshing Organic Prosecco, followed by a tasting of extra special red and white wines including Barbera, Chianti Classico, Super Tuscans and more. The final wine, Carpezza Vin Santo, was a one-of-a-kind dessert wine that everybody seemed to enjoy. The catered hors d'oeuvres by Andy Burke, including the artisanal cheese selection, were delicious as always. Our event took place at Shreve, Crump & Low's stunning jewelry showroom on Greenwich Avenue where attendees were able to peruse their extensive time piece collection, one-of-a kind vintage jewelry pieces and other objets d'art. This was truly ..."an evening to remember." Our tour included tours and tastings at two of Connecticut's finest vineyards in Litchfield County (Hopkins Vineyard and Sunset Meadows) and lunch at the famous White Horse pub. In the beautiful Litchfield countryside, Hopkins Vineyard sits on a hill overlooking Lake Waramug in what may be one of the most scenic areas of Connecticut. Established in 1979 by Bill and Judith Hopkins at what was once their family's dairy farm (as one of the first vineyards in Connecticut), Hopkins continues to be family owned and operated to this day. Today the winery offers 11 excellent varietals and has received numerous awards for their wines. We enjoyed a three course al fresco lunch (al fresco, at this popular eatery which offers a versatile menu and has been described as " backcountry gentility" . White Horse is owned by an Englishman, John Harris, who renovated the restaurant in 2009 and has attracted a large following. This bucolic winery near Litchfield offers flavorful wines, good service and a beautiful country setting. Their 13,000 vines with western exposure on over 50 sloping acres are in an ideal setting for optimum sun exposure and consistent air-flow which are important for vine health. 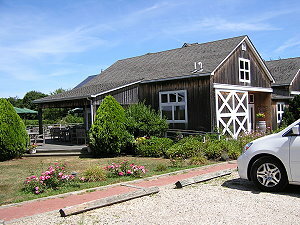 The winery has state-of-the art equipment and was voted "one of Connecticut's best " by Connecticut Magazine. Our Wine Lovers' Cruise on July 22nd was well-received by those who joined us aboard the "Prudence" thanks to good company, splendid weather, tasty hors d'oeuvres (including a raw bar with oysters and clams), and of course, a great selection of refreshing summer wines, including a savory home-made Sangria. This has been the third year that we've organized this fabulous event . On June 17th, 2015 we retuned to the Ginger Man (the event was held in their beautiful upstairs private party room overlooking Greenwich Avenue -- scene of our very first event seven years ago) for a very special wine tasting. We sampled several summer wines from Provence, Beaujolais and the Cotes du Rhone. As we often do, we began with a reception featuring a sparkling Cremant from Burgundy, accompanied by light hors d'oeuvres and good company. Our special guest, author and oenophile extraordinaire, Paul DeBary provided exceptional commentary and copies of his book, "The Persistent Observer" were given to all attendees. We had a delightful evening in celebration of the Greenwich Wine Society's Seventh Anniversary. Several different kinds of Prosecco were served while members mixed and mingled with fellow wine enthusiasts ... tasty hors d'oeuvres too! The event took place at last year's popular venue, the C. Parker Art Gallery on the Post Road in the heart of Greenwich. Our hostess Tiffany Benincasa, gallery founder and owner, has assembled a gorgeous, colorful collection of attractive contemporary artwork titled "Art in Bloom" -- a "must see" exhibit and a stunning setting for our annual celebration where over 55 wine lovers turned out. We started out with a Prosecco reception in our own private party room on the second floor of this charming Greenwich eatery --both the Prosecco and hors d'oeuvres were most delectable and the company of 30 or so wine aficionados seemed to get along famously. For our savory, multi-course wine dinner each course was matched with a glass of fine Italian wine. (click here for menu) Ned Towle, wine judge and founder of the Westchester Wine School provided excellent commentary. In spite of winter rain and threats of snow, 21 erstwhile oenophiles showed up at Bar'Lees in Mamaroneck on March 4th to sample Pinot Noirs from France, Australia the U.S and Chile. 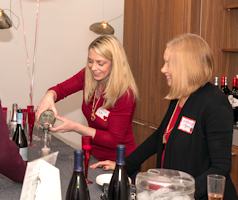 As we begin most of our events, we started with a reception featuring a blush Cremant from Alscace made with Pinot Noir where attendees had the opportunity to network and chit chat about life, love and the pursuit of wine happiness. Greenwich Wine Society Director Dean Gamanos opened up the tasting with a description of the attributes of Pinot Noir and why it is considered a "Noble" red varietal. In case you didn't know, Pinot Noir became the wine of choice in Burgundy France in the Middle Ages by edict of Phillip the Bold, one of the famous Dukes of Burgundy. Pinot Noir is rapidly becoming a red wine of choice not only among savvy wine connoisseurs but new wine drinkers as well (the movie Sideways had a positive impact on Pinot Noir's growing popularity while adversely affecting Merlot sales). The hors d'oeuvres were ample and delicious as were the wines. At the end, door prizes were presented and Jonathan Greenberg and his friend Cora managed to win two. Way to go Jon and Cora! Thirty wine enthusiasts converged on the Tarry Market in Port Chester on November 20th for a very special tasting of French wines from the Rhone Valley. Just in time for Thanksgiving we had the opportunity to sample six exceptional red wines both from the northern and southern Rhone Valley following a Prosecco reception complete with delicious cheeses and charcuterie. Rhone wines are known for their high quality and favorable price points when compared to French Burgundies and Bordeaux. To guide us through the region, on hand were Morgan Pruitt, manager of Tarry Wine Merchants and Neil Rosen of Rosenthal Imports who provided excellent commentary. Among the wines sampled were both the much applauded Chateauneuf du Pape and a Cote Roti. This program which was both educational and fun was definitely among our best events! We had a good turnout for our September 24th tasting at the Thos. Moser furniture gallery in Greenwich. The wines were all well-received as was the food by Andy Burke catering. The Loire Valley Sancerre and Chenin Blanc as well as the Macon La Roche Chardonnay from France seemed to be particularly savored but many also liked the La Crema (also a Chardonnay) from California and the sparkling Cava (Rose) served during the reception. The handmade furniture on display as well as paintings by New England artists were an added treat. With the great venue, tasty wine and food, as well as good camaraderie, we'll have to try this terrific event again some time. 2014 WINE LOVERS CRUISE -- A SENSATIONAL SAILABRATION! Our Wine Lovers Cruise held aboard the "Prudence" out of Greenwich Harbor on September 12th, was our best ever. The fabulous weather helped of course but so did the great hors d'oeuvres (freshly shucked oysters, sumptuous cheeses and more) prepared by Andy Burke Catering, the home-made white and red Sangria and other tasty wines, the songs of guitarist Katie Nelson, not to mention the fantastic camaraderie of our fellow wine lovers... all-in-all, an evening to remember! Over 30 wine enthusiasts gathered at Polpo restaurant in Greenwich to sample six seductive Italian wines along with out-of this-world hors d'oeuvres (e.g." to-die-for" swordfish oreganata, juicy meatballs, mini pizzas and more!). The wines were all ,of course, sensational and delightfully enjoyed (among the favorites...Layer Cake Primativo, Casalino Chianti Classico Riserva and the Mauro Sebaste Gavi from Piedmont (DOCG). After the event, a number of our erstwhile wine tasters meandered downstairs to Polpo's lively cocktail lounge to hear live music and for more Italian culinary treats. A wine dinner at Polpo (also one of the most romantic venues in town),will no doubt be in the cards for a future Wine Society Italian eat and drink dinner-fest. On Thursday, December 12th Wine Society members gathered at the new Anam Cara Gallery on Greenwich Avenue to view the art (including some new works by Will Day and Kimberly Salib), one-of-a-kind jewelry (including Celtic pieces by gallery owner Patty Maguire), and to sample some delicious wines, perfect for the holidays (10 in all). This event, which lasted from 6 to 9 pm, was more of a holiday party (as opposed to a structured tasting) and included hors d’oeuvres, and of course, plenty of networking. It was priced to please (only $20 including hors d’oeuvres) and over 40 attended… a good time was had by all. The art and jewelry were beautiful and wine pairing suggestions were included in the handout. Thank you Patty for opening your gallery to our group! On November 14th we vicariously visiting Bordeaux, France, the most famous wine region in the world. Our informative, sit-down tasting featured wines from both the region’s Right and Left Banks, including wines from Graves, Medoc, Pommerol and St Emillion. We were fortunate to have Deidre Magnello of Terroir ( a distributor which specializes in Bordeaux ) on hand for commentary. The tasty hors d’oeuvre prepared by Chef Philippe Shapiro from Wine Wise were also quite special. 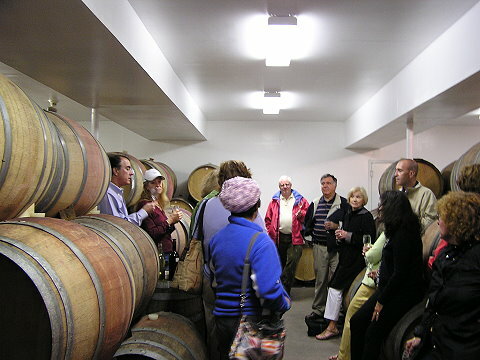 Close to 30 wine aficionados joined us as we visited 3 of Long Island’s best wineries --we made stops at Paumanok Vineyards, Macari and Bedell Cellars for vineyard and cellar tours, fine wine tastings and great fun. On the way back we stopped at a farm stand and on the bus got to see the movie Sideways. This was such a great trip we’re likely to partner with the Westchester Wine School again in the Spring for a Hudson Valley tour. Stay tuned! On September 27, over 50 wine lovers joined us for an evening cruise on Long Island Sound aboard a charming wood-hulled antique steamer built in 1911. It originally ferried passengers to islands off coastal New England and later on took Cape Cod tourists to view the Kennedy compound in Hyannis Port (it was also used by the Kennedys for off-shore entertaining). Our wine tasting started with a delightful Cava from Spain followed by a number of wines from maritime countries…favorites from Italy, France and coastal California. The catered food was well-received; fresh oysters paired brilliantly with the dry Muscadet from France and Andy Burke’s unique hors d’oeuvres were well-received. The Moscato d”Asti was a perfect finale for this delightful evening! A survey afterwards showed that everybody loved the cruise so it looks like this will become another annual Wine Society happening! 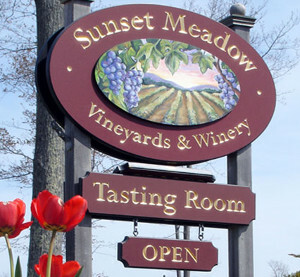 On August 18 we visited three vineyards, Sunset Meadow Vineyards in the Litchfield hills. We had an al fresco lunch at Millbrook Vineyards and Winery, the largest winery in the Hudson Valley, then toured the facilities and sample their wines. Our third stop was Clinton Vineyards, not far from Millbrook. This charming, boutique winery, a Hudson Valley favorite, produces an excellent Seyval Blanc, champagne and luscious dessert wines. Dean - Thank you for putting together an excellent evening! I hope you enjoyed it as much as we did! Wonderful wines, setting and other wine enthusiasts. Looking forward to the next one! The weather man cooperated for this pool-side event which was a “sold out” affair. We’re sorry if you missed out but you can still order these refreshing, flavorful wines from WineWise on the Post Road in Greenwich (just east of Whole Foods) at a 10% discount through the end of July. Click here for wine list. On Wednesday evening, June 12th the Greenwich Wine Society held its first-ever Australian wine sampling at a new Australian wine and whisky lounge in Mamaroneck called Bar’Lees. As always, we began with a reception, this time with an Australian sparkling Shiraz (“that’s Australian for Syrah mate!”). Other wines from Australia were served: Sauvignon Blanc / Semillon Blanc blend (popular Down Under), a Chardonnay, a Cabernet / Merlot blend and a non-bubbly Shiraz. Delicious hors d’oeuvres too (including kangaroo meat balls, crab quesadillas and more). This event Sold-Out! In celebration of the Greenwich Wine Society's Fifth Anniversary we gathered at the C.Parker Gallery on East Putnam where we served 3 different kinds of Prosecco. Gallery owner Tiffany Benincasa was on hand to answer questions about the artwork. Prosecco, a sparkling wine from the Veneto region of Italy, is made from Prosecco grape using the Charmat method. It's flavor is simple, light, and refreshing...a perfect bubbly for a Spring party. This was not meant to be an educational event but lots of merriment and a minimum of talk. Our wine dinner attracted a happy group of foodies as we sampled several wines that paired well with Indian cuisine. TAWA, the scene of our culinary adventure, is an award-winning, highly ZAGAT-rated eatery in downtown Stamford. We began as we usually do with a reception. Tasty Indian hors d’oeuvres were served with an Austrian Gruner Veltliner, a previously obscure varietal that’s getting more attention these days by chic wine geeks – everybody seemed to like its aromatic freshness. Then we sat down for our starter course paired with a Gewurztramine from Washington’s Columbia Valley …good reviews here as well. The main course was accompanied by a tasty German Riesling (Dr. Heidmanns-Bergweiler). A sparkling Prosecco was poured with dessert. Good food, good wine and good company! We had an extra- special wine tasting at the C. Parker Gallery in Greenwich on February 28. The C. Parker collection features colorful impressionist oil paintings from around the world (gallery owner Tiffany Benincasa was on hand at the event). We sampled glorious red and white wines from Burgundy, Bordeaux, the Loire Valley and other regions of France. 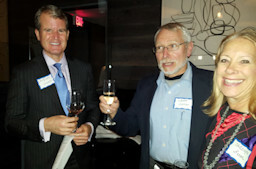 As always members networked with fellow wine lovers and made new friends. Delicious hors d’oeuvres from Burke Catering were served... A good time was had by all. We had a fabulous evening of wine sampling, tapas tasting, networking and fun as we learned about the wonderful wines of Spain. This extra-special event took place at Sonora Restaurant in Portchester which features highly rated, Nuevo Latino cuisine ( run by celebrated Chef Rafael Palomino who is also involved with the nearby Greenwich Tavern and Pacifico in New Haven). Attendees heard about the various wine varietals of Spain and its regions. Spain happens to be one of the world’s largest wine production nations but doesn’t get the attention of others. We tried Cava, Albarino, Grenacha, Tempranillo and other varieties. Plus during our reception we sampled passed hors d’oeuvres as only Sonora can prepare them ( …Mahi Mahi roasted corn and chipotle cakes topped with saffron aioli, Avocado and pomegranate mousse over corn arepas, and, Quinoa and eggplant, goat cheese empanadas with chocolate vinaigrette). Mmmm…certainly an evening to remember! We celebrated Bastille Day with a wine dinner at the legendary La Cremaillere in Bedford/ Banksville. This venerable eatery is housed in a 1750’s farmhouse and has been attracting gastronomes for over 60 years. After a champagne reception in the restaurant’s lounge we moved into the dining room room for a multi-course dinner, each course paired with a delicious wine (culminating wth a pastry plate served with a French Muscat (St Jean Minervois)… Magnifique! We sampled wines from the various regions of Greece, all made with indigenous grape varieties. These unique wines are capturing the attention of oenophiles from around the world (and most recently praised by NY Times wine editor, Eric Asimov). The tasting was held at Eos restaurant in Stamford, Ct. Needless to say, delicious Greek hors d’oeuvres were also served. The Greeks have a word for it…Oopa! Every spring we’ve been celebrating the Wine Society’s anniversary with a Prosecco party at various venues around Greenwich. This year’s was held at the Mitchell Gold + Bob Williams furniture gallery on Putnam Avenue. Three different kinds of Prosecco from Horseneck Wines were served and hors d’oeuvres were prepared by Amanda Smith Catering. A very, very good time was had by all (as is always the case at our Prosecco parties)! Our follow-up event to February’s intro to Italian wines was a “sell-out” success with over 50 participants. On hand were Leah and Peter Votto from Votto Vines who led the commentary as well as Jeb from Val's who also lent his expertise. For our reception we sipped a delightful sparkling Verdicchio along with some tasty hors d’oeuvres. The beautiful new Toscana Trattoria on Lewis Street, was the perfect place for our gathering. We also tasted a marvelous Vernaccia, a well-received Valpolicella, a hearty Nero d’ Avola from Sicily, among others. The highlight of the tasting was a Brunello de Montalcino, San Lorenzo which was highly rated by Wine Spectator. We sampled wines from some of Italy’s most famous wine regions…Piedmont, Tuscany, Veneto, and Abruzzo, among others. Italy has a multitude of grape varieties, a large number of wine regions and thousands and thousands of wineries, many of which produce some very fine wines. Our tasting at the stunning Toscana Trattoria in Greenwich was helpful in acquainting our members with some of the more popular varieties like Gavi di Gavi, Chianti, Barbera, Multepulciano, Nebbiolo, and a Super Tuscan. The new Toscana Trattoria on Lewis Street is a sight to behold. With its lush tapestries, comfortable seating, high ornate ceilings and attractive light fixtures it’s certainly one of the more impressive venues in town…somewhat reminiscent of a villa in Florence. We sampled delicious wines one can enjoy with Thanksgiving dinner or anytime. We gathered at Barcelona’s private party room to network, sip, and savor Pinot Noir, Chardonnay, Zinfandel, Montepulciano d'Abruzzo, Cote du Rhone and more… delicious hors d’oeuvres too. We were also fortunate to have Amy Dixon "sommelier extraordinaire" stop by to comment on the wines. 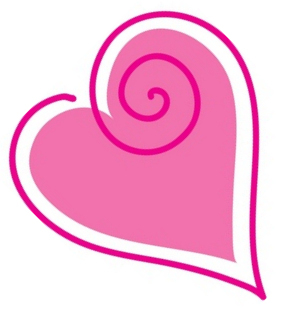 We helped Friends of Autistic People with a fund raiser to support adults with autism. Close to 50 people gathered at the Fayle Cebter of Greenwich to hear about FAPccomplishements as we sampled fine Chilean wines. Saturday, July14th we held a tasting at the Cavalier Galleries on Greenwich Avenue as we celebrated Bastille Day with a variety of French wine. We sampled flavorful wines from the various regions of France, like the Loire Valley, Cotes du Rhone, Alsace, Burgundy and more. This stand-up reception was a fun gathering where you could make new acquaintances as well as meet old friends. Onur chartered bus departed from Greenwich Harbor for a full day of tours, tastings and fun on Long Island's picturesque North Fork. Our first stop was Lieb Cellars where we sampled their excellent sparkling wine, a scrumptious White Merlot and other divine wines. At Laurel Lake Vineyards after an al fresco lunch overlooking their vineyards wine maker Juan Sepulveda took us down to his cellars for a very special barrel tasting. Then it was off to Sherwood House for another round of exceptional wines. Wow!...a delightful day of wine learning and wine tasting (we strive to make our events both informative as well as fun). We had a record turnout at the Gingerman in Greenwich for what has become a popular annual event. During our reception we sipped some delicous sparkling Cava from Spain. Then we sat down and tried some refreshing Torrontes from Argentina, a rose from the Cotes du Rhone, a slightly sparkling Moscatel from Portugal, a delightful Vernaccia from Italy and a Beaujolias (Fleurie) from France. Yummy hors d'oeuvres too! We celebrated the Society's third anniversary with a Prosecco party at the new Jewels by Viggi on Greenwich Avenue. Attendees sampled three Prosecco's...Villa Jolanda, Lunetta by Cavit and Mionetto II Rose (accompanied by Swedish meatballs, Prosciutto with melon, mini quiches and assorted cheeses. This was a delightful evening in a stunning venue (we were surrounded by exquisite sparkling gems displayed in a gorgeous showroom). Over 30 wine enthusiasts met at Le Wine Shop in Greenwich to sample several wonderful wines from France’s Rhone Valley. Cotes du Rhone is an important wine region that has become more popular in recent years by offering fine wine at a good value vs. the more expensive French wines from Burgundy and Bordeaux. We were fortunate to have with us a represenatative from Maison Gabriel Meffre in Gigondas, one of the leading wineries in the region. The program began with a sparkling wine reception where we enjoyed La Chasse du Pape, a white blanc de blanc made with 100% Chardonnay. Other wines sample that evening were : La Chasse White (2008 Cotes du Rhone), La Chasse Red (2009 Cotes du Rhone), Gigondas Domaine de Longue Toque (2007), and Laurus Cote Rotie Red (2005). As a finale we sampled the extraordinary Laurus Muscat Beaune de Venise (2008). All-in-all a very enjoyable (and delicious) evening. The evening began with a reception on the terrace with its scenic views of the the Hudson, featuring Lieb Cellars sparkling wine coupled with tasty hors d’oeuvres as only the chefs at Equus could prepare them. Each course was paired with an appropriate wine personally selected by Stu Baldwin (AIFW’s Connecticut Chair) and Dean Gamanos, Director of the Greenwich Wine Society. The wild salmon apple cress salad was paired with an exceptional German Riesling (Weingart 2007) and the acorn squash pansotti appetizer was served with a delightful 2005 Volnay from Burgundy. The fabulous loin of lamb entree was perfectly matched with a Clos du Val Cabernet Sauvignon 2007...mmmm superb! The delicious dessert, an apple spice cinnamon cheese cake, was all the much better with a Ramos Pinto 2004 LBV Port. Our host, Yvette De Vries from African Portfolio gave a brief introduction to the history of wine in South Africa, and share some of her experiences traveling in Africa. Other white wines we tasted were Robertson’s Sauvignon Blanc and a KWV Roodeberg (Chardonnay / Viognier / Chenin Blanc). For reds we sampled Barista Pinotage, Black Pearl Oro (Shiraz/ Cab Sauvignon) and Pepper Pot (Syrah/ Mouvedre/ Tannant). Guests were able to order any wine they liked. The North Fork of Long island is a beautiful area where world-class wines are now being produced. Our bus left from Greenwich at 9:15 AM stopping first at Paumanok Vineyards in Aquebogue, where the Massoud family turns out some very special wines. 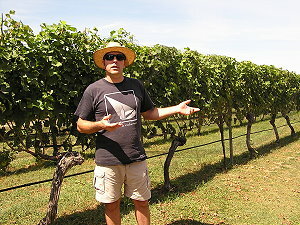 Kareem Massoud took us out to the vineyard and explained their viticultural techniques (see photo). After a tour and tastings we were off to Pellegrini Vineyards and their gorgeous winery for another round of tastings and a casual al fresco lunch overlooking the vineyards. Our third stop was Castello di Borghese where AnnMarie and Marco Borghese produce excellent, award-winning wines. Marco spoke to our group and the wines were well-received (these are three of the North Fork’s best wineries). On the way back our bus also stopped at Briermere Farms where we picked up some fresh local produce and home made pies and then returned back to Greenwich at 6:30 PM. 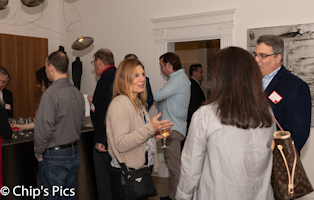 On April 22 we held our annual Prosecco Party at the Mitchell Gold + Bob Williams furniture gallery in Greenwich to celebrate the Society's Third Anniversary. And, on June 23rd the popular third annual "Wines of Summer" tasting was held at the Gingerman -- it was a hot evening (temperatures were close to 90 ) but the light, refreshing wines sampled were the perfect antidote! Our first event of 2010 was a Wine and Chocolate tasting. We had a delicious evening of hand-crafted chocolate treats along with delightful wines to match. Our tasting was held at the Abby M.Taylor Fine Arts Gallery (on Greenwich Avenue) surrounded by gorgeous paintings and stunning sculptures. Chocolate was provided by Martine Coscia, chocolatier extraordinaire and founder of the new The Little Chocolate Company. It was an evening to remember! On September 23, 2009 we tasted wine from the Charles Krug Winery, which has been open since 1861. We once again held "The Wines of Summer" May 20th and again at The Gingerman. We introduced our guests to some delightful wines that are perfectly refreshing for summer sipping...including Albarino from Spain, Gavi from Italy, Torrontes from Argentina, Moschofilero from Greece, and more. And on July 15th we celebrated Bastille Day with wines from France's Loire Valley. On May 6th we celebrated the Wine Society's first anniversary with a Prosecco tasting at Solaia Ristorante and Wine Bar on Greenwich Avenue: "Prosecco! Prosecco! Prosecco!". It's hard to say which was preferred more...the delightful bubbly or the delicious hors d'oeuvres. The overflow crowd seemed to love both. Our first event in 2009 was a delicious tasting of "The Wines of Alsace" paired with savory hors d'oeuvres from this unique region of France. Wines were provided by Le Wine Shop and the presentation was held next door at Le Gourmet Store where Monsieur Alex provided his insightful commentary. "Magnifique!" In June 2008 we visited two excellent Connecticut wineries (Chamard and Gouveia Vineyards) and had a savory 3-course lunch (with excellent wine, of course) at the historic Griswold Inn in charming Essex, CT.
Other 2008 events included "Fine Art and French Wine" at the Cavalier Galleries in September and a Food and Wine pairing dinner in November. Our second event in May 2008 featured “The Wines of Summer” and every seat in the house was filled thanks to some very favorable articles in the local press about our new Club. Our Club held it’s first event on April 23, 2008 at The Gingerman Restaurant in Greenwich, Connecticut -- a tasting of “old world” vs. “new world” reds featuring the four great international red grape varieties. There was good wine, good food, fellowship and it seems a good time was had by all. Certified wine educator and wine judge, Ned Towle, led our group in a sit-down tasting which was both fun and informative (and that’s pretty much going to be the modus operandi of the organization – events where you’ll definitely learn more about wine but also in a setting which allows for fun and networking). 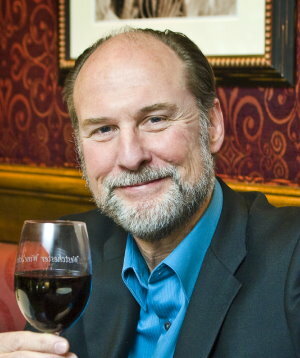 Please check www.GreenwichWineSociety.com periodically for news about upcoming wine programs.